In 2017 revenues from green taxes were 21.6 billion euros, 3.9 percent more than in 2016. Since 2001 revenues increased by 51 percent. In 2017 the total amount on revenues of the Dutch government were 180,5 billion euros; of which 12 percent on green taxes. Green taxes are mainly linked to the possession and use of motor vehicles. In 2017 the Dutch government received 8.2 billion euros on excise duty on petrol and other mineral oils, 2 billion euros on private motor vehicle and motorcycle tax (BPM) and 5.6 billion euros on road tax. Of the total of green taxes 5.8 billion euros is coming from environmental levies (about 25 per cent). Revenues from environmental levies especially concern taxes on energy fuel, waste, drinking and ground water, packaging and flight tax. In 2017, almost 40 per cent of green tax revenues comes from excise duty on petrol and other mineral oils. Revenues from excise duty on petrol and other mineral oils were a little higher in 2017 than in 2016. Due to a stop on low taxed red diesel for agricultural vehicles and machines excise duty revenues increased since 2013. 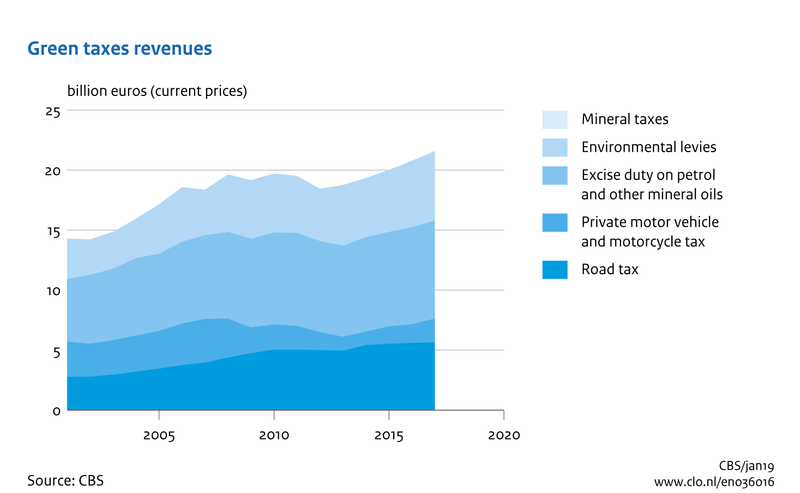 In 2017, about a quarter of the revenues from green taxes comes from road tax. Every owner of a car, delivery van, motorcycle or lorry in the Netherlands is required to pay road tax every quarter, or once a year. The rate depends, among other things, on the type of engine. As part of a mobility tax plan (Ministerie van Financiën, 2011), the government changed regulations concerning the road tax and the BPM. Fuel-efficient cars, such as hybrid cars, were made exempt from road tax several years ago. This exemption was limited in 2014, and disappeared in 2015. In 2017, more than 9 percent of the revenues from green taxes came from the BPM. The first time a car is registered, BPM must be paid. The amount of the BPM is dependable on the emission of carbon dioxide. Electric passenger cars are exempted from BPM. Revenues from BPM have declined since 2007. In 2015 revenues increased considerably and came back to the level of 2012. In 2016 and 2017 revenues kept increasing. CBS (2018). StatLine: Milieubelastingen en milieuheffingen; opbrengst naar betalingsplichtige (current prices). CBS, Den Haag / Heerlen. CBS, PBL, RIVM, WUR (2019). Green tax revenues, 2001-2017 (indicator 0360, version 16 , 24 January 2019 ). www.environmentaldata.nl. Statistics Netherlands (CBS), The Hague; PBL Netherlands Environmental Assessment Agency, The Hague; RIVM National Institute for Public Health and the Environment, Bilthoven; and Wageningen University and Research, Wageningen.